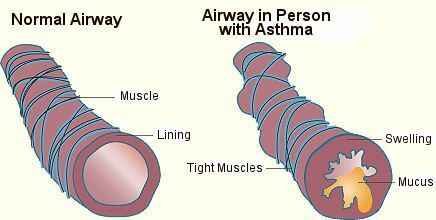 Causes of Asthma: What Causes Asthma? Many people nowadays suffer from chronic asthma. This is a condition characterized by inflamed airways that are oversensitive to things that do not often bother other people. 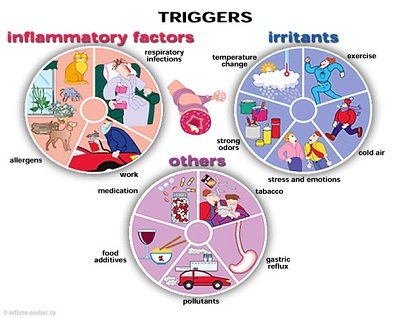 Of course, we are speaking of triggers or causes of asthma. Asthma causes can vary from individual to individual. Certain people will react to few asthma triggers, while for others the symptoms show after minimal exposure to many things. Therefore, being diagnosed with asthma means that you really have to keep track of the triggers that most commonly cause your asthma attacks and symptoms. In the majority of cases, the symptoms of asthma do not occur right after the person is exposed to a certain trigger, so this may be a bit tricky. Depending on the trigger type and the patient’s sensitivity, the episodes may occur after a longer or shorter period of time. People who develop asthma signs and symptoms commonly suffer from allergic asthma. This means that allergens are the triggers of the asthma attacks. Allergens are substances that cause allergies to develop, which means that an asthma attack may occur after you inhale, swallow or smell a thing you are allergic to. This is why it is highly important to avoid any type of contact you have with known allergens that may cause an asthma attack. Cockroaches are found in any place in the world, starting from the coldest and finishing with the warmest areas of the world. The majority of urban homes fight these insects, whose feces and body parts are believed to be common allergens and causes of asthma symptoms. Dust mites are tiny creatures that we cannot see with the naked eye. They have the looks of a spider and feed on the flakes of the human skin. These are the most widely known allergens, especially their feces and body parts. They are found nearly everywhere, most commonly in clothes, toys, bedcovers, carpets, pillows, mattresses, upholstered furniture and fabric. Pollen is a common allergen that comes from grasses, weeds and trees. The particles are airborne and peak in certain seasons of the year. Sometimes, these allergens can linger in a certain place and act as asthma triggers throughout the whole year. The feces, saliva, hair, urine or skin flakes of pets are considered to be allergens that trigger asthma attacks too. If this is the trigger for your asthma symptoms, you really should consider avoiding exposure to pet’s allergens. The allergens of animals are very often found where no animals live. This is interesting fact that not many people know, but people can actually carry such allergens from place to place and spread them around. Therefore, you do not really need to have a dog or be directly exposed to its dander or hair in order to get in contact with the allergens. Wherever there is moisture, there is mold. It can grow in soil, woods, outdoors, indoors and on plant debris. You can find mold near pipes, leaky faucets, basements or wet shower stalls. The molds produce spores that reproduce and become airborne, which makes it much more difficult to avoid such allergens. Allergens can cause allergic reaction after they enter the patient’s body. You can get in contact with these substances by touching them, injecting them, swallowing them or inhaling them. The immune system of allergic asthma patients find certain substances to be harmful and responds by releasing immunoglobulin. Grand quantities of this substance can trigger the swelling of the lungs’ airways, which is a symptom of asthma. This swelling can make the breathing process difficult and trigger an asthma episode. You can suspect to have allergic asthma, but only a doctor can confirm such diagnosis. Simple blood or skin test can show the immune system’s respond to certain allergens and help the doctor in determining whether the allergens that trigger your asthma are only seasonal or year round. Generally speaking, allergic asthma is the most common type of asthma worldwide. In the United States, 60% of the 25 million people who have asthma actually react to allergens. There is no difference in symptoms of allergic and non-allergic asthma. Aside from the most common allergens, certain irritants found in the air can also trigger asthma. Such irritants include wood fires, charcoal grills, chemicals, cigarette smoke, smog, ozone, strong odors, strong vapors, and dust and air particles. Certain illnesses of the respiratory system can also result to be asthma causes. Such illnesses include pneumonia, sore throat, the flu, colds, sinus infections etc. Such asthma causes are most commonly found with children diagnosed with this chronic condition. Certain activities such as exercise can make your breathing more difficult and affect your asthma. When exercise is done in cold air or even in general, this may result to be a fierce cause of asthma. The form of asthma triggered by physical activity or exercise is called exercise-induced bronchoconstriction. The symptoms of this type of asthma do not always appear while the person is exercising, but may also appear after few minutes. Proper treatment allows asthma patients to exercise regularly without any problems. A healthy body is your best defense against any disease, so you should not avoid exercise if you have exercise-induced asthma. If you have asthma episodes after or during workout, you should opt for proper management of symptoms and prevention. If you do this, you will be free of asthma symptoms. As you already know, exercise causes shortness of breath and this does not solely apply to asthma patients. The obstruction of airflow that comes as result of exercise in asthma patients is more serious than in other people. If you are having exercise-induced asthma, you may experience coughing, chest tightness, shortness of breath and wheezing. The first symptom is the most common symptom and in most cases, that is the only symptom of asthma there is. When a person exercises, the breathing becomes faster and deeper because the body demands more oxygen. The dry and cool air you are inhaling trough the mouth while exercising, instead of the nose, causes the airway to narrow down. This is why exercising in cold places is even worse for asthma patients. If you have EIB, you should avoid activities in dry or cold weather, such as skiing, snowboarding, ice skating or ice hockey. In addition, you should avoid those activities that require constant action such as long distance running or even soccer. If you are an asthma patient, you should still exercise but pick out the best possible activities, such as those that use short exercise bursts. Such activities include gymnastics, volleyball, and baseball. You can also opt for leisure biking, swimming in warm water or simply walking. Weather can also cause asthma symptoms, especially if one is exposed to cold air, dry wind or sudden weather changes. Regardless if you are feeling or expressing strong emotions, these can be a strong asthma trigger. Such emotions include excitement, laughter, crying, yelling, fear and anger. If you are an asthma patient and start feeling changes in mood, try to control the breathing. Such emotions may cause wheezing or other common asthma symptoms in asthma patients. Some medicines you are taking may be the cause of asthma attack. Therefore, if you are sensitive to nonsteroidal anti-inflammatory drugs or aspirin, you should consult your doctor and avoid them. In addition, you may notice that beta blockers increase the asthma symptoms and make the whole controlling process more difficult to handle. If you experience any symptoms after getting in touch with these triggers, you should immediately discuss them with your health care provider. More and more people are developing this condition every day. The most probable cause of this is the diet we are consuming, the housing and hygienic habits we have. Some researchers are considering the chance that improvement in hygiene may reduce the number of children diagnosed with asthma. If children are less at risk of infection, they are less at risk of developing this condition.